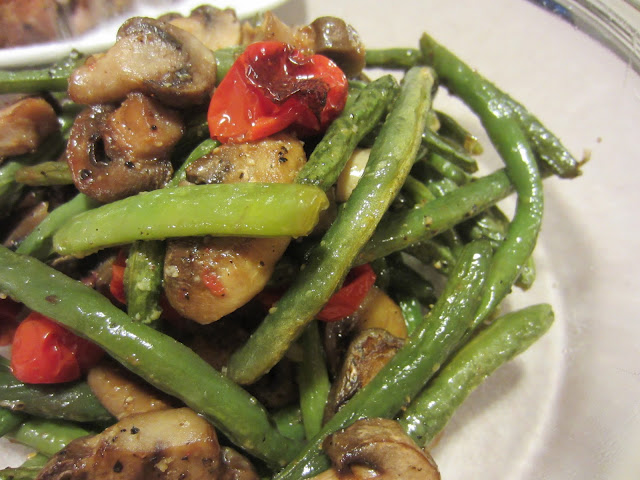 One of my absolute favorite recipes is Oven Roasted Green Beans with Garlic. I don’t know what it is about the combination of Balsamic Vinegar and garlic roasted together in the oven but I look forward to getting green beans in my basket just so that I can make this recipe. Last week not only did we get green beans but we also got some great looking Cherry tomatoes. So I changed up this recipe a bit by adding in a 8 oz. container of baby Bella mushrooms and my Cherry tomatoes cut in half. It was a great side dish to our dinner! Preheat oven to 400 degrees F. Spray a 13 x 9 inch baking pan. Place green beans in the pan. Scatter garlic, onions, mushrooms, and tomatoes over the top of the green beans. Drizzle with olive oil and sprinkle with salt and pepper. Bake uncovered for about 30 minutes; opening the oven every 10 minutes to stir. Transfer to serving dish and drizzle with balsamic vinegar. I was super excited to receive a basket full of Baby Bella mushrooms this weekend in our Bountiful Basket. I love mushrooms but Baby Bella’s are in my book the best. My husband and I debated about how we were going to cook them. A lot of times we marinated them and then skewer them and cook them on the barbecue. 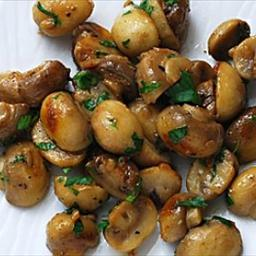 A great way to enjoy mushrooms but this time around we tried sautéing them in garlic butter and they were awesome. We had ours along side chicken but these would be great on top of steak with a sprinkle of blue cheese crumbles. Or they are fantastic as a stand alone side dish. Either way these are a must try! 1. Melt butter in sauté pan or skillet over low heat. Add garlic, salt and pepper and cook until fragrant, about 1 minute. 2. Add mushrooms and toss with garlic butter to coat. Cover pan and cook for 10 to 12 minutes, stirring occasionally, and making sure garlic doesn’t burn. Just before serving, toss mushrooms with parsley. 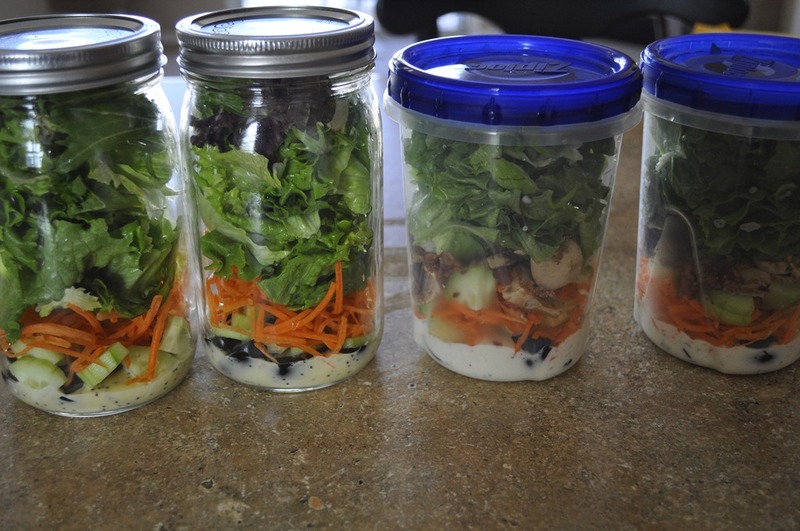 Over the last few weeks I have seen this whole salad in a jar idea and I was a bit skeptical. First of all the salad dressing is at the bottom of the jar with all the other salad ingredients layered on top and this scared me a bit. I was defiantly intrigued and had to give it a try. Anything that I can prep on the weekend so that I have lunch all week sounds like a great idea, not to mention it is portable and healthy depending on what you put in it. As it turns out this is a great idea and works wonderfully!! 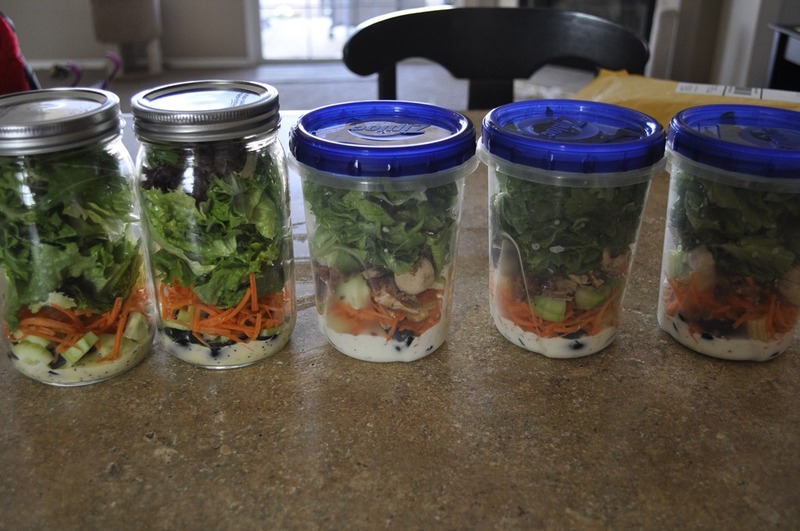 I made mine in mason jars since I would be eating at home. I made my husbands in Ziploc plastic containers so that he wouldn’t break the glass jars. Start off by placing 1-3 Tbsp. of your favorite dressing at the bottom. Then layer on your salad ingredients making sure that the lettuce doesn’t touch the dressing because it will become not so appetizing. Then store in the refrigerator for up to a week. Everything stayed crisp and all you do is just shake it up and enjoy when you are ready. For the salads you see above I used carrots, olives, cucumbers, baby corn, mushrooms, bacon on my husbands, and lettuce. I added avocado to mine once I was ready to eat it since avocado browns quickly. But the possibilities are endless and a great way to have a healthy lunch on a busy weekday! I having been meaning to make a Portobello mushroom recipe for awhile. There are a great substitute to meat because if you season them they really will have a very similar taste to them. We were unable to get Portobello mushroom caps so I just got a package of already sliced Baby Portobello’s and they worked out just great. I really enjoyed this recipe and hope you family does as well. 1. Heat a skillet on medium-low heat and add 1/2 Tbsp. olive oil. Add sliced onions with a pinch of salt and let caramelize, stirring occasionally. Cook for about 8-10 minutes, then turn off heat and set aside. 2. While onions are caramelizing, brush mushrooms with remaining olive oil and sprinkle both sides with pepper, paprika, onion and chili powder. 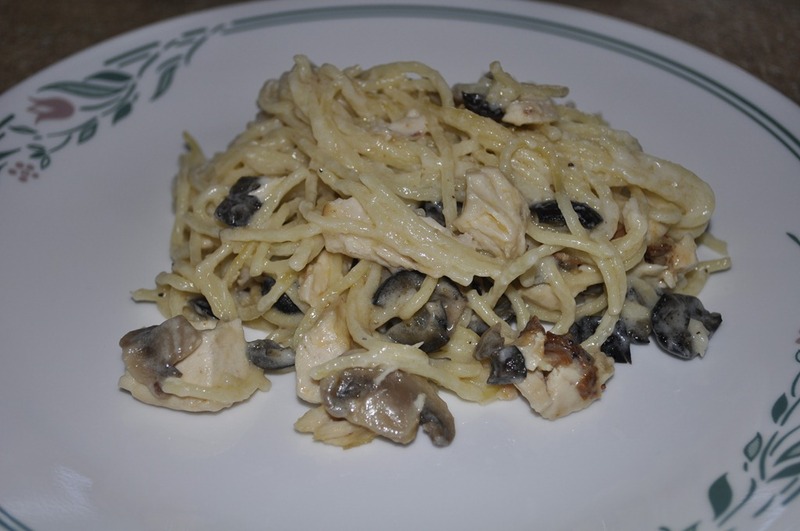 Heat a skillet or grill on medium heat and cook until mushrooms are juicy and tender. About 5 minutes on each side. With 1-2 minutes remaining, add a slice of Gouda on top to melt. 3. 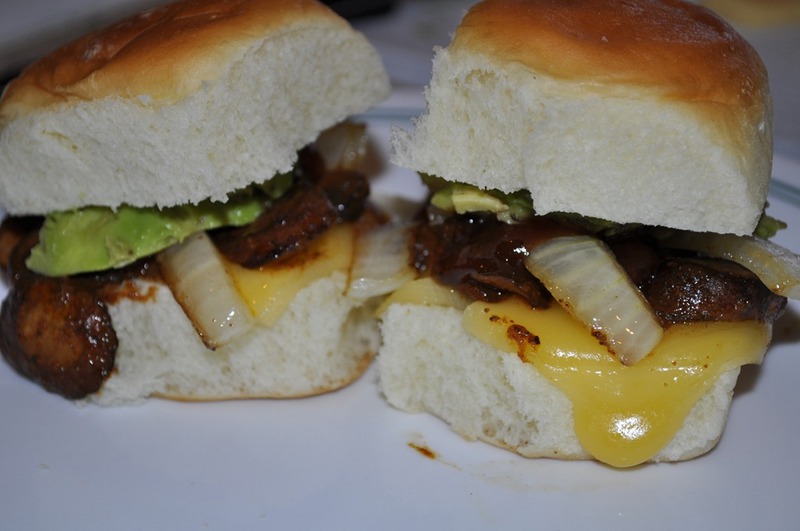 Assemble sliders by placing the mushroom on the bun, then top with onions, avocado, and as much BBQ sauce as you like. I am always a big fan of anything stuffed with cheese so when I saw this recipe on Two Peas and the Pod I was excited to give it a try. What made it even more appealing was the spinach and mushrooms inside the cannelloni. What a great way to add some more veggies into you meal especially with kids. This recipe did take more time than I usually put into a weeknight dinner but it wasn’t hard and the end result was amazing. This amazing picture was taken by Two Peas and Their Pod. I forgot to take a picture until mine was half eaten and the end result was not nearly as pretty as this one. 1. Preheat oven to 350o F. Spray a 9 x 13 baking dish with cooking spray and set aside. 2. To make the filling-in a large sauce pan heat olive oil over medium-high heat. Add onion and garlic, cook until tender. Stir in spinach and mushrooms, cook until mushrooms are soft and spinach is wilted. Remove from heat. 3. In a large bowl, stir together ricotta cheese, mozzarella cheese, and parmesan cheese. Add egg and mix until well combined. Stir in spinach mushroom mixture and seasonings. Set aside while you make the sauce. 4. To make the sauce: in a large stock pot heat olive oil over medium-high heat. Add onion and garlic and cook for about five minutes. Add red pepper flakes, fennel seeds, and diced tomatoes. Stir in tomato paste. Add fresh basil and season with salt and pepper. Simmer on stove for about 20 minutes. 5. For the pasta: add lasagna noodles to a large pot of boiling salted water. Cook for three minutes or until the noodles are al dente. Do not over cook, they will finish cooking in the oven. Carefully remove noodles from water and lay flat on a wire cooling rack. 6. To assemble the cannelloni: spread about a 1/2 cup of the sauce in the baking dish. Spread about 1/4 cup spinach ricotta filling in a line along one short side of the lasagna noodle. Put 1 Tbsp. of sauce on top and then roll up to enclose filling. Carefully transfer cannelloni to pan and place seam side down. Continue stuffing and rolling remaining cannelloni. 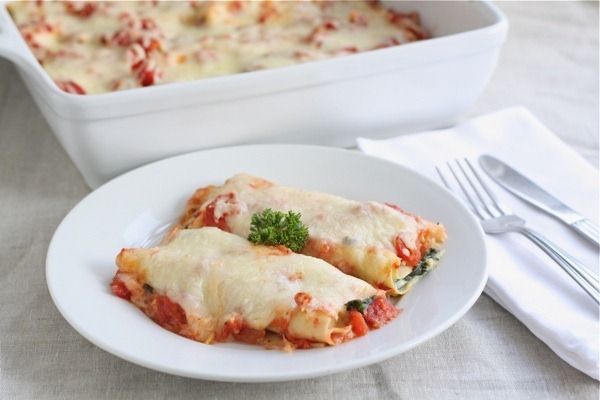 Top cannelloni with remaining sauce and 1 1/2 cups mozzarella cheese. Cover pan with foil and bake until sauce is bubbling, about 30 minutes. Remove foil and bake for 5 additional minutes, until cheese is melted. This is a recipe that I adapted from The Bride & Groom First and Forever Cookbook. 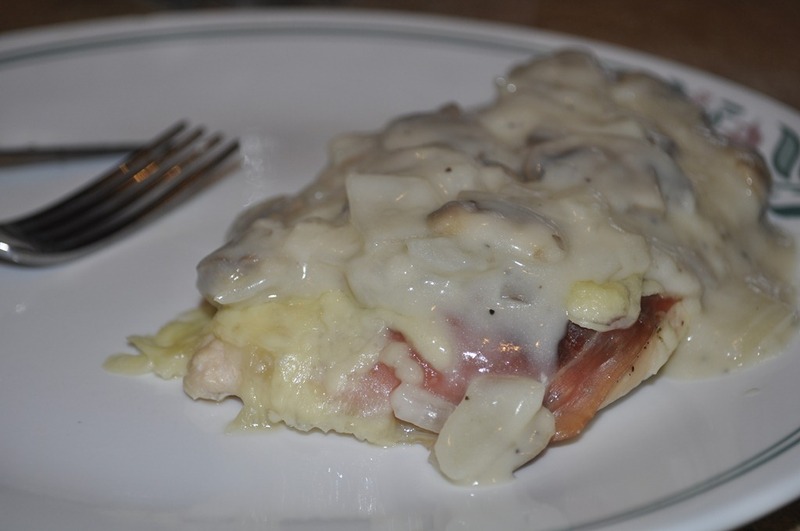 This recipe is full of flavor with the Prosciutto and the mushroom sauce. The white wine in the sauce gives it another layer of flavor. The great thing about this recipe is once you have the technique down you can change things up by using ham and Swiss with a bit of Dijon mustard. The possibilities or endless. Start off by pounding the chicken breasts down to a 1/4 inch in thickness. Then sprinkle with the sage, salt and pepper. 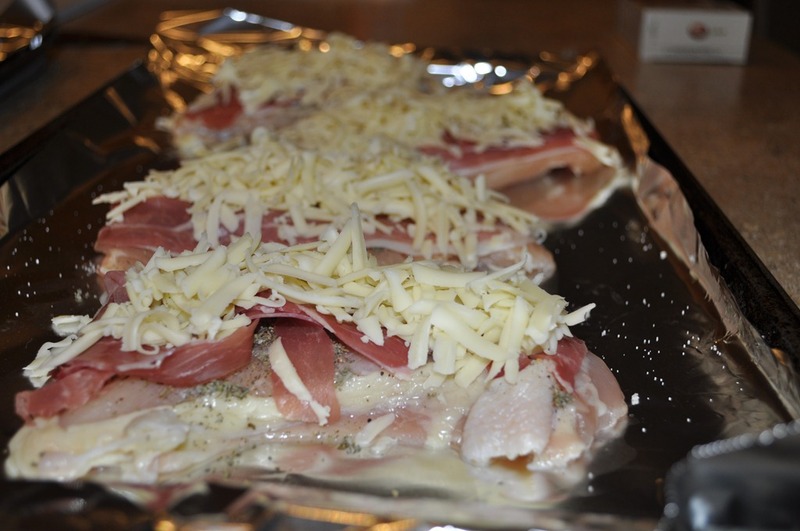 Place one piece of Prosciutto on top of each chicken breast and top with the Fontina cheese. Then bake at 425o F for 15 minutes until the chicken is cooked through. While the chicken is in the oven prepare the mushroom sauce in a skillet. Top the chicken with the mushroom sauce and enjoy. ~ 2 tsp. minced fresh sage or dried sage. 1. Preheat oven to 425o F. Line a baking sheet with aluminum foil and spray lightly with cooking spray. 2. Place a chicken breast between 2 sheets of plastic wrap. Using a mallet or a heavy skillet pound it forcefully until the chicken is about 1/4 inch thick. Repeat with the reaming chicken breasts. 3. Place the chicken breasts on the prepared baking sheet and season lightly with salt and pepper to taste. Sprinkle 1/4 of the sage on each breast. Top each breast with 1 slice of prosciutto and some of the Fontina cheese. Bake for 15 minutes or until the chicken is opaque in the center. 4. Next, heat the olive oil in a large skillet over medium-high heat. Add the mushrooms and onion and season lightly with salt and pepper to taste. Sauté until the mushrooms are golden brown, 6 to 8 minutes. Sprinkle the flour over the vegetables and stir to coat. Cook for 1 minute. Add the white wine and cook until it evaporates, 1 to 2 minutes. Add the stock and cream, increase the heat to high, and cook until the sauce thickens, 3 to 5 minutes. 5. Place a chicken breast on a plate and top with the mushroom sauce and serve.